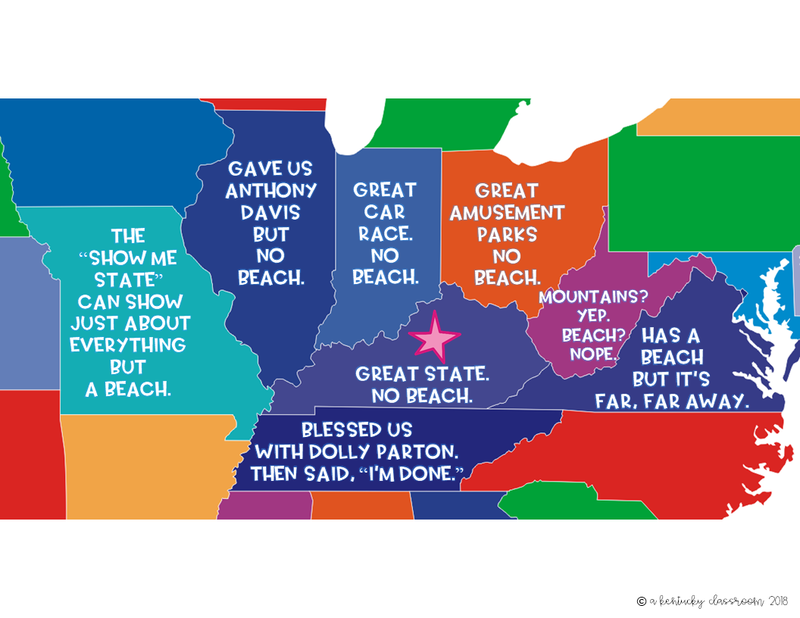 There are many perks to being a resident of the Bluegrass State, but one of the definite downsides has to be the fact that you're landlocked. 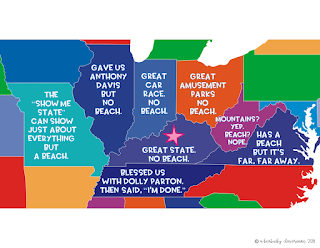 While Kentucky has its share of beautiful lakes (one of which is in the county where I live), we are not blessed with salt scented air, sandy beaches, gorgeous water, or waves. So should one have a hankering for salt scented air, sand, clear water, or waves, you must traverse outside Kentucky. And while every personality test I've ever taken scores me as a 99th percentile extrovert (which strikes me as accurate as my mother began refusing to go shopping with me because, "you know too many people and have to talk to everyone and it takes forever to get out of Walmart"), I genuinely treasure time to myself. Probably because I was an only child for five years, but it is no big deal for me to do stuff like supper, movies, or even going to the bathroom solo. Last (school) year was somewhat more demanding than I anticipated; thus I decided if I could find a trip to someplace tropical at a decent price, I would pack my bags at a moment's notice and go. I also decided this trip needed to be just me, even though it was an incredibly selfish decision. So I watched and waited, and once I was certain my trip would not include an encounter with a hurricane or tropical storm, I booked a week long trip to Jamaica. Because it was a somewhat impulsive trip (I booked the trip on a Thursday afternoon for a flight that would leave that Sunday morning) I didn't tell many people about it. This trip gave my father two good reasons to worry: not only would I be traveling alone, but I would be headed to a place I'd never been before. My father was not the only one concerned for me: if I had a dollar for every time someone advised me to "be safe" or "be careful" I'd have been able to to straight up buy Jamaica. I'd also like to take a moment here and point out that it's laughable people told me to be careful. While I was headed to an all-inclusive resort, that was as wild as I got. I don't drink, do drugs, or even stay out late. I was going down there to simply relax, not find love or even make any new friends. I didn't even want a fabulous tan. I would be perfectly happy to simply drink Coca-Cola on the beach, read, and listen to the ocean. Therefore, every time someone advised me to be careful, those words were met with an internal, "Surely you jest. You know nothing's gonna happen". Fast forward a week later and I'm back on American soil, refreshed and still white as a ghost (seriously, I'm nearly glow in the dark I'm so pale). Other than a two and a half hour flight delay going to Jamaica, an hour delay leaving Jamaica, and it taking two and half hours to go from the runway in Cincy through customs and out the door, everything was amazing. And I'm not too proud to admit that while leaving the Valu-Parking Lot I was pretty full of myself-I'd experienced a wonderful break and not a thing had gone wrong. So about 30 miles south of Cincy I pull over and hit McDonald's and pull back on the road. By this time it's almost 9:30 p.m. and dark, but I'm not thinking about that. So whilst doing 70 mph on I-75 South, what happens but that light comes on. And the temp gauge goes red. And while I love the color red, I don't like it when it's glaring at me from my dashboard. Long story short: my car overheated. Upon calling my parents and admitting that things were going less than smoothly, I called AAA. At 9:35 at night. They were incredibly kind and said they would send someone to assist me and that since I have the gold membership my car could be towed for 100 miles before I would be charged. I happened to be about 94 miles away by then, so this was music to my ears. So they said they would list me as a priority, and my tow should be there by 10:40 pm. Then, I kept getting texts saying my case had been updated and my help would be arriving later. My knight in shining tow truck arrived at 12:50 a.m.
My mother (who is truly mother of the year) met me at the mechanic's at 2:55 a.m.
After spending much of the flight reading The Amy Binegar-Kimmes-Lyle Book of Failures you feel a distinct kinship with the author as you are failing to make it home and inconvenience your mother. You realize that a smartphone is expensive but worth every penny as it helped you locate the nearest exit so you would not spend Saturday night on the unlit side of I-75 South with cars shooting by you at terrifying speeds. You realize you're glad you're solo. I would not have wanted kids with me because that was a long wait for just me, so I can only imagine what it would have been like to have kids along who would have been scared/bored/arguing/hungry/thirsty/needing to go to the bathroom. You realize that your next date needs to be with a guy who knows a little bit about automobiles. You get to continue reading that fabulous book The Amy Binegar-Kimmes-Lyle Book of Failures. In fact, you read so much that you get to the page that lists her social media handles and you tweet your new fav author and SHE REPLIES. And was so sweet and kind it helped balance out the fact that it's 11:00 at night and the heat index is 83. When the tow truck does arrive to take your car to the mechanic, you have a captive audience to hear all your vacay tales. It's 2 am so little to no traffic. You make all the lights. When your BFF (who's an insurance guru) texts you at 11 and asks if you made it home safely and you call her and tell her what's going on, she can share her expertise and remind you why that's your bestie. The looks you get from patrons of the Sunoco station as you are carefully watching each pair of headlights hoping it's your tow. You get to spend so much time in your car your tablet charges from 66 to 100. In 3 hours. Take that Elon Musk with your car that goes 0-60 in 2 seconds and your plans to make it go even faster. Realize though you have 2 degrees you are EMBARRASSINGLY ignorant about your car and what is wrong with it. Get woke, girl. Get woke. Automatic marker of trip: you will forever remember this trip as the one when I broke down. I love that you can "see" positives in a very trying time. Says a lot about the kind of person you are.